David Beckham- the world-famous soccer star, celebrity, and sports icon- has joined the Los Angeles Galaxy soccer team! 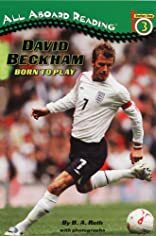 As captain of England's famous soccer team, Manchester United, Beckham singlehandedly scored 85 spectacular goals and became the only English player to score in three World Cups. With an easy-to-follow narrative and actionpacked full-color photos, this book is sure to score with young readers. About B.A. Roth (Author) : B.A. Roth is a published author of children's books. A published credit of B.A. Roth is David Beckham: Born to Play: Born to Play (All Aboard Reading).